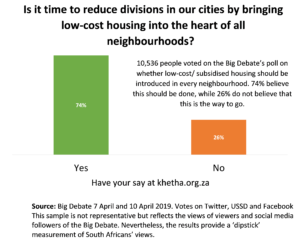 Followers of the Big Debate support the inclusion of low cost housing in all urban neighbourhoods, according to a poll undertaken before and during this week’s episode. Almost three quarters of respondents answered yes to the question “Is it time to reduce divisions in our cities by bringing low-cost housing into the heart of all neighbourhoods?”, while only 26% opposed the idea. Apartheid spatial planning persists in South African cities, twenty five years after the advent of democracy. The Sustainability Institute’s Mark Swilling acknowledged that the post-1994 government built four million houses, but most of these have perpetuated apartheid patterns. Because markets determine higher property values closer to jobs and infrastructure, the poor are relegated to the outskirts where land is cheaper, but transport and other costs are higher. It was also noted that the transport modes used by the majority of the population received no subsidies, while the Gautrain and bus systems were subsidised. While the law protects private land ownership, it is incontrovertible that so-called ‘land invasions’ have changed the ballgame through de facto redistribution of large tracts of urban and peri-urban land. Musa Gwebani, from Khayelitsha’s Social Justice Coalition, underlined the need to change language use around land invasions, pointing out that colonial land laws were as inherently criminal as current invasions are portrayed. “Instead of criminalising informality and land invasions, start embedding it within local government goals,” she advocated. Participants also called for a change in how we talk about development and development planning, questioning why the rich live in ‘suburbs’, while the poor live in ‘housing’ and why ‘informal settlements’ are regarded as temporary, even when they have existed for decades. Johannesburg mayor Herman Mashaba’s comments about foreign nationals in the inner city were denounced as fuelling xenophobia by Gwebani and others. Discussion turned to the recent Alex Shut Down protests – predicated on lack of service delivery as well as dissatisfaction over housing allocations. People who have registered do not appear on the database while others who have been allocated houses don’t live in them. Protest organisers have called for the upcoming elections to be delayed until the Zondo Commission has concluded and corrupt leaders are held accountable. The rich and nuanced debate underlined the need for leaders and society to creatively re-envisage urban planning and land usage policies, sooner rather than later.